July | 2016 | 50 Westerns From The 50s. Jack Davis, the great Mad magazine illustrator, has passed away at 91. The panels you see here are from “Hah! 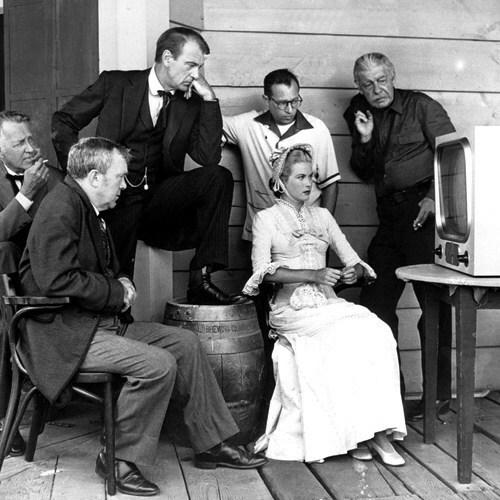 Noon!,” Mad‘s parody of High Noon (1952). Sable Ranch Lost To Wildfire. The Sable Ranch in Santa Clarita, California, has been destroyed by the latest wildfire. 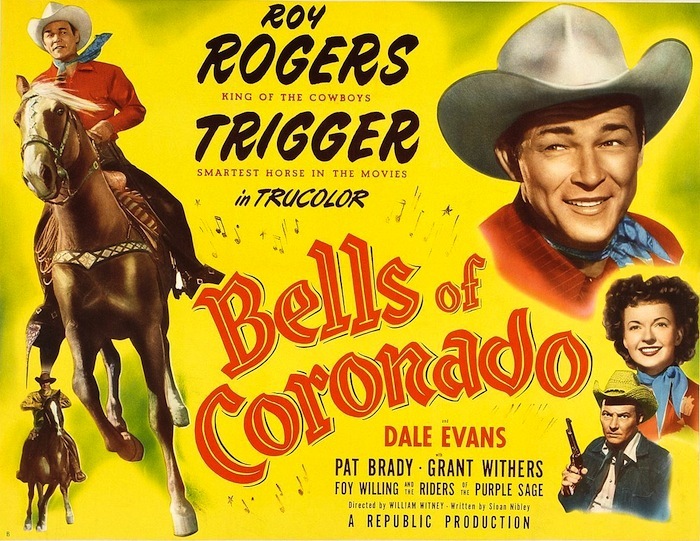 One of the films shot there was the Roy Rogers picture Bells Of Coronado (1950). Directed by William Witney and shot in Trucolor, it’s terrific — and it’s the only Trucolor Rogers to get an official release on DVD. 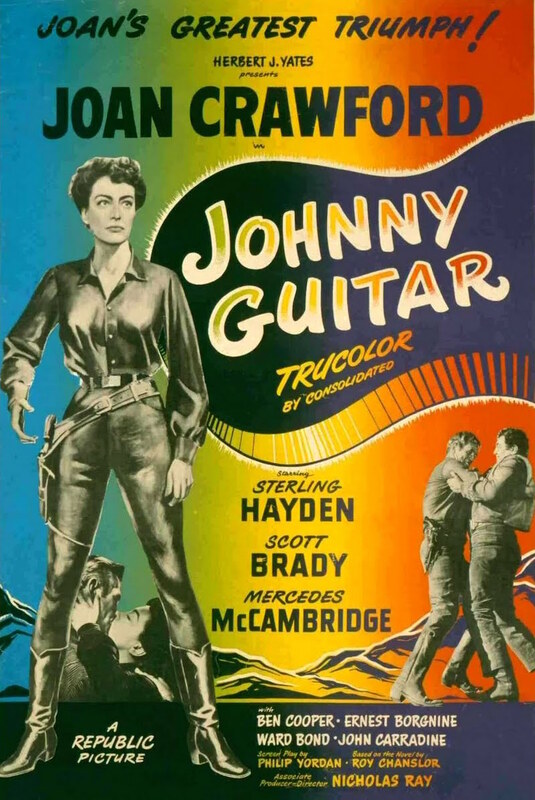 50s Westerns DVD News #217: Johnny Guitar Signature Edition (1954). Olive Films has launched their new Signature series with a couple titles we’ll all be interested in: High Noon (1952) and Johnny Guitar (1954). With Blu-rays from new 4K scans and a slew of extras, these should be terrific. For Nick Ray’s weird and wonderful Johnny Guitar, the best extra has to be the correct 1.66:1 framing. Ray was an absolute master at composition — and maybe the King Of CinemaScope — and I’m sure this proper aspect ratio will make all the difference. Watch for them in September. “Adult Coloring,” 50s Westerns Style. “Adult coloring” is a bit of a fad these days — at least here in the States. Some say it helps them relax, unwind, focus and all kinds of therapeutic stuff. 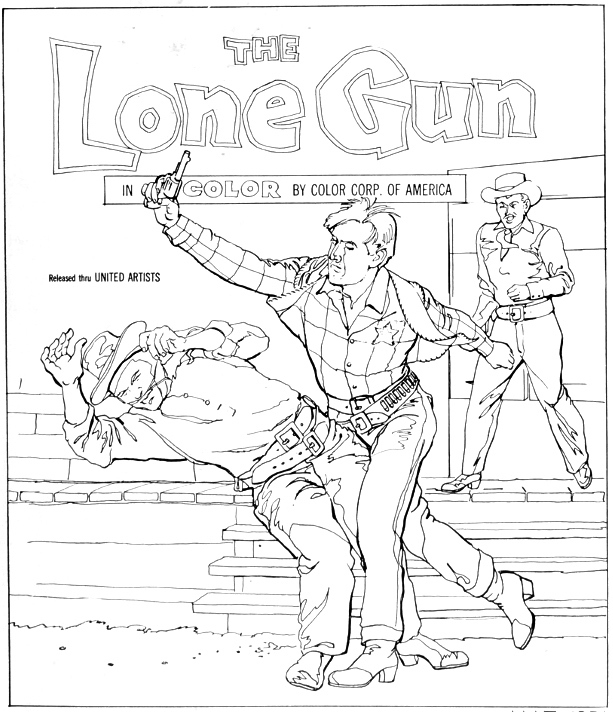 Here’s a coloring contest page that was offered up in the pressbook for The Lone Gun (1954). If I was gonna sit down and color, George Montgomery punching some guy would be therapeutic enough for me. 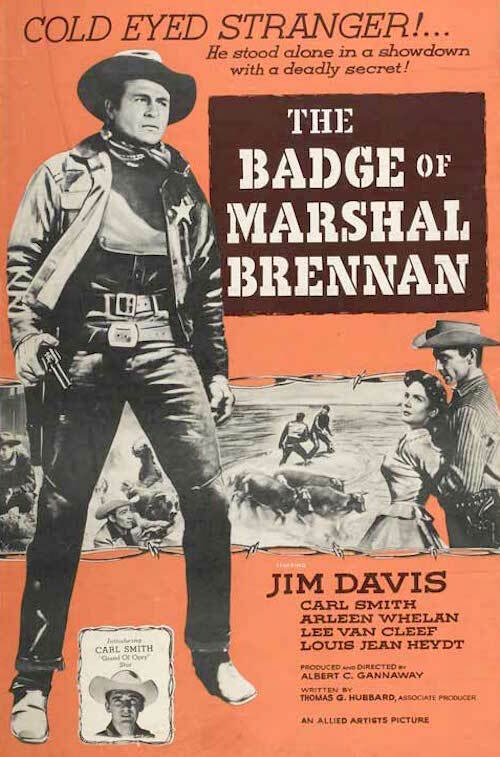 The Badge Of Marshal Brennan (1957). I’ve been meaning to dive into Jim Davis’ pictures from the 50s — the ones where he has the lead — for quite some time. It took someone asking about such a thing to make me finally take it on, so let’s kick things off with The Badge Of Marshal Brennan (1957). Davis is an outlaw on the run who happens upon the dying Marshal Brennan (Douglas Fowley). He takes the man’s badge and rides on to the next town. There, mistaken for the marshal, Davis helps take on a powerful rancher whose diseased cattle have created an epidemic that threatens to kill off the town. The story’s nothing new, the sets are cheap, the music — a guitars-only score by Ramez Idriss — is kinda thin (and odd), and some of the camera set-ups seemed rushed. But there’s still something about The Badge Of Marshal Brennan I liked. It might be the cast. Davis is fine, of course. Arleen Whelan is good in one of her last roles. Lee Van Cleef, Louis Jean Heydt and Harry Lauter are as dependable as ever. And a couple country music stars from the period, Carl Smith and Marty Robbins, are thrown in for good measure. 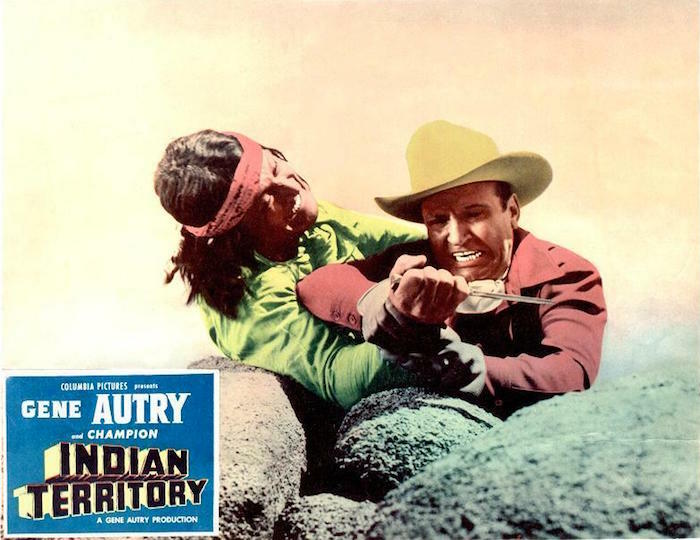 The Badge Of Marshal Brennan was followed by Raiders Of Old California (1957), again from director Albert C. Gannaway and much of the same cast. They were both shot outside Kanab, Utah, and at Cascade Studios in Hollywood by Charles Straumer. Badge was released by Allied Artists; Republic handled Raiders. You can find both of these on Amazon or even YouTube. While they’re not gonna knock you out, it’s a shame they’re not available on DVD.